The colors in this week’s Stampin’ Royalty challenge totally had me flashing back to the 1980’s! The mix of black with the neon colors definitely caught my attention! Here are this week’s colors, if you’d like to play along! The cardstock is by Stampin’ Up!, and the zebra paper is by Glitz Design. The mini letter stickers are by Making Memories. The shoe stamp is from a Fiskars clear set. I stamped all of the shoes in Basic Black SU ink. I used a pink Glaze pen to color/modify the white Thickers. I like the effect that it created…like a neon sign. The little jeweled buckle is from a craft store. Thanks very much for visiting! I’m so happy that I can share my work with you! 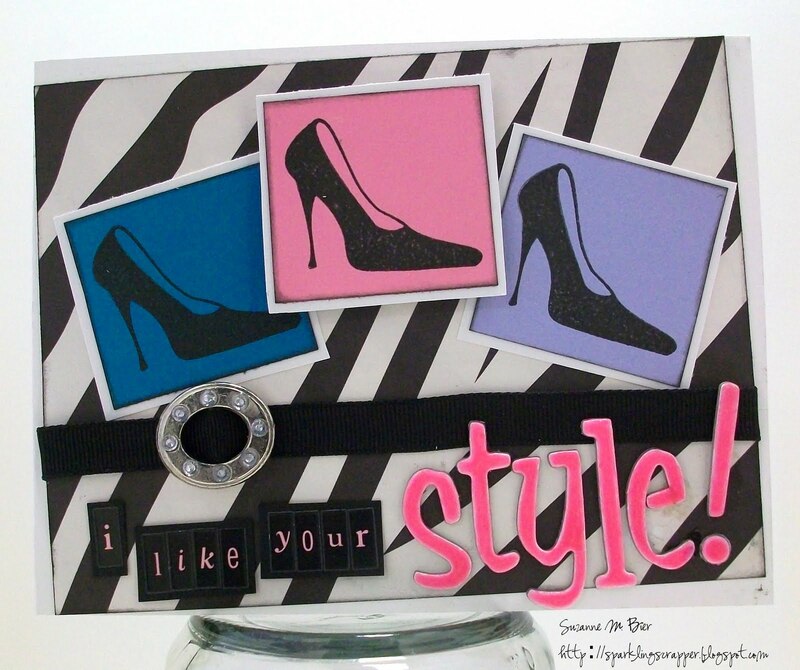 That's a great card – the colors definately go with those shoes! I love your design. Thanks for sharing with us at Stampin' Royalty! Very cool! I love the 80's feel to the card! Thanks for playing along with us this week at SR! Great use of this weeks colours! I love the shoes. As always thanks for playing with us this week at Stampin' Royalty. You're right… it is sooooo 1980's! I love your card! What a fabulous job! Thanks so much for playing with us at Stampin' Royalty this week! Great card, love the zebra background!